C. Sherman Johnson Company Incorporated was founded in 1958 by Curtiss S. Johnson Jr (1925 - 2005). Mr. Johnson's love of sailing inspired him to design and manufacture stainless steel turnbuckles, fittings and marine accessories for the pleasure marine market. Many patents and innovative designs lead Johnson Marine (Trade Name) to become one of the largest OEM supplies of life line hardware in the marine industry. Somewhere in the middle 1980's Johnson Marine started to be contacted by architects looking to design railings in buildings using stainless steel aircraft cable with the cable as infill for the railings. At the time this new "cable railing" was thought to be a "fluke" or an anomaly that was a niche design fad. Little did anyone know it was not. After many calls for cable railings, the light bulb went on and a new division was formed called Johnson Architectural Hardware to design, market and manufacture specific architectural hardware for cable and wire railings. The new division took off and Johnson cable rails can be found in private homes, commercial, municipal, educational, medical and sports arenas. Stainless steel cable does not block your view and adds a custom look to deck railings, stair railings and railings in general. Approximately two-thirds of C. Sherman Johnson Company's business is non marine primarily in the architectural field. Johnson offers cable and wire fittings in 1/16" to 3/8" sizes in type 316 stainless steel for machine swage, Hand Crimp, mechanical termination and splice termination. 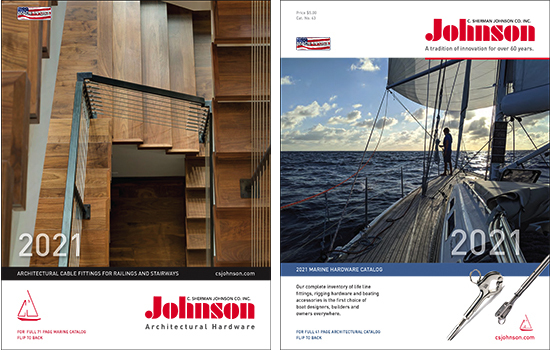 In the latest Johnson Architectural catalog you can find cable railing hardware and Terminal Tuner, Classic, Decko, Smooth Line, Terminator and Threaded Terminal Turnbuckles to accent the look of any infill cable system. In the latest Johnson Marine catalog you will find life line turnbuckles, pelican hooks, gate eyes and Splice Line fittings. Standing rigging turnbuckles are offered in open, tubular and slotted configuration. Dinghy and one design turnbuckles are not forgotten with quick release levers, calibrated stay and shroud adjusters, Handy Lock Turnbuckles, split back stay cars and toggle jaws. Johnson offers a full line of cotter pins, clevis pins, rigging pins, ring pins, quick release pins, lock rings and lock nuts. You will find what you need to cable rail your next project or rig your sailboat at C. Sherman Johnson Company and it's made in the USA.